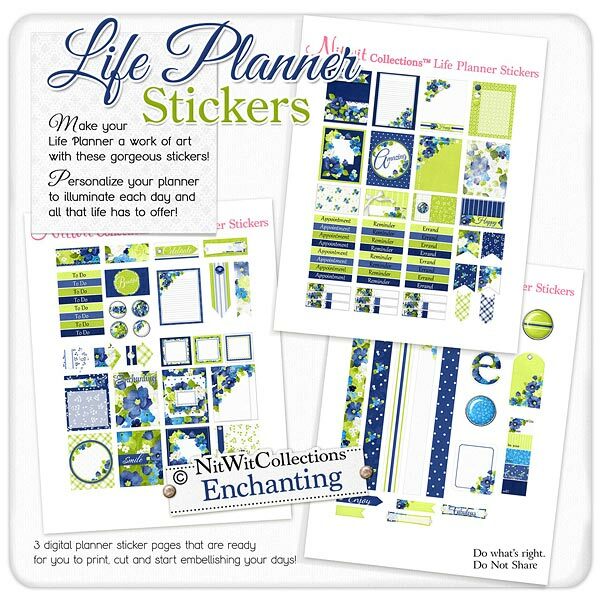 "Enchanting" Life Planner Stickers is a bold and beautiful collection of elements to give your life planner such pizzaz!! The rich florals in the navy blue and green really draw your eye in and the additional stickers and pieces will give your planner pages such class. Refined beauty, just like you!!! 17 - 1.5" x 1.9" full boxes that will make your life planner pages glow!! Two of these have lined interiors that are perfect for making lists, notes, and more! 5 - 1.5" x 0.95" half boxes that you can add to your days as title tops or add them in wherever you need a splash of colour! 4 - 1.5" wide box strips that you don't have to use anywhere specifically. Why not put the "Celebrate" one near your noting of a birthday, or the green rose strip on the top of your page...it's worth looking at everyday!! 3 - Arrow elements pointing out how great you are!! 2 - Full size flag strips....plant your flag and mark your page! 4 - 0.5" resin drops which are such usuable elements to decorate blank areas of your page! 5 - 7.25" long digital washi tape like elements. Perfectly sized to fit your life planner pages...and even have extra depending on the make of your planner....who doesn't like extra?! 1 - Hanging tag with a top grommet. You may want to print this one on regular paper and tie a string on it....so many uses for this colourful tag!